this week, a rare glimpse here into the thai classical tradition! you'd be forgiven for thinking, from the content of this site, that i don't have much interest in thai classical music.. but that's really not the case. rather, it's down to the fact that i like to have as much background as i can on the artists i present here, and that the world of classical releases is, more often than not, totally devoid of discographical info. 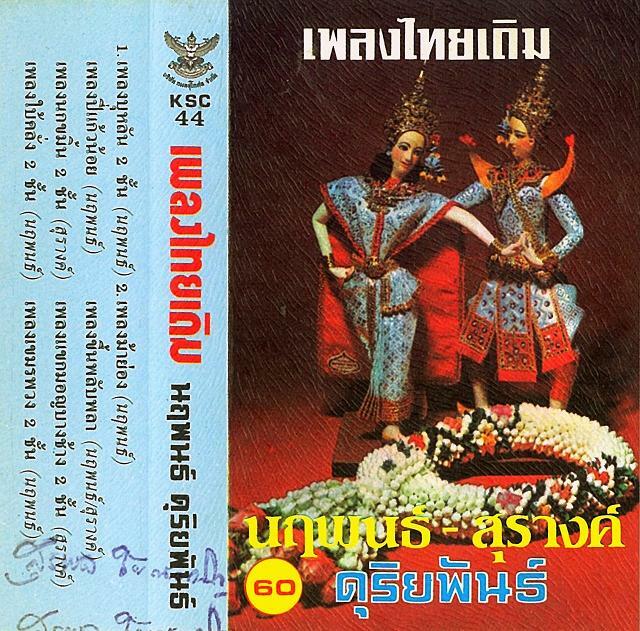 that said, this week's cassette is well-annotated, due to the presence of two star vocalists, mr. naruephan & ms. surang duriyaphan. this brother-sister duo are the children of khru nieow duriyaphan, head of the thai fine arts department under luang wichitwathakan in the 1930's. here they are backed by khana duriyaphan, the legendary group of instrumentalists assembled by their father. this is thai classical vocal music of the first order.. enjoy! This is beautiful, Peter. Thank you! This is music to crash your car with. I doubt I could pay attention to anything if this was in my ears. Thank you!